Taylor Made produces taper buoys and Boatersland Discount Marine Supplies has these mooring buoys in stock. The Sur-Moor 18 inch taper buoy (part number TAY46718) has a 2 ½ inch tube diameter, a buoy diameter of 18 inches, height of 16 ¾ inches and a buoyancy of approximately 70 pounds. The Sur-Moor taper shape design places more flotation area at the waterline creating a higher visibility mooring. Similar to T3C buoys, these taper buoys have a hard-skin polyethylene shell that is UV protected to resist the weathering effects of sunlight. In addition, the buoy is close cell foam filled to positively displace water. 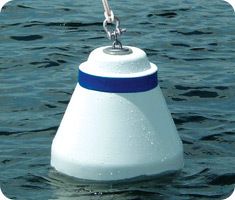 The mooring collar for this buoy is not included but is available at Boatersland Marine as a related accessory. This collar, part number TAY33025, is the Taylor Made 2 ½ inch T3C mooring collar. The mooring collar is made of hot-dipped galvanized steel and is ideal for protecting the buoy from anchor chain wear.